Mine On The Beach At Porthpean - a Memory of Porthpean. My father, Charles Axford, found a mine on the beach in the morning. As it was a hot summers day he carried it into the back room upstairs of the Watch House as he knew many people would be coming & informed the coastguard. After school I went down for a swim and undressed & dressed in the front room of the upstairs of the Watch House. At 6 o'clock the bomb squad arrived from Plymouth & cleared the beach & were horrified that my father had carried the mine wearing his coastguard hat which had a large metal badge on the front that could have exploded the mine! My father carried the mine back to the beach without his hat & when the mine was exploded it went higher than the top of the cliffs! A memory shared by Christine Dodgson (Nee.Axford) on Feb 22nd, 2014. Send Christine Dodgson (Nee.Axford) a message. 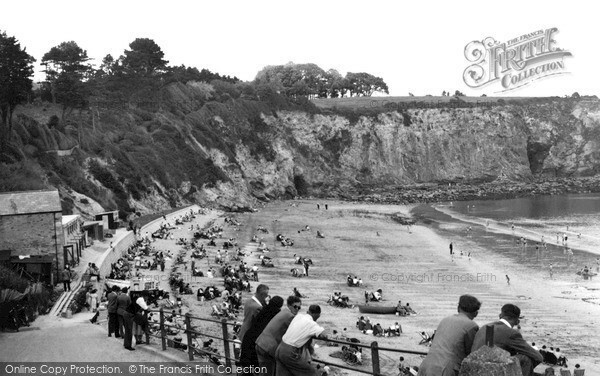 Add a memory of Porthpean.